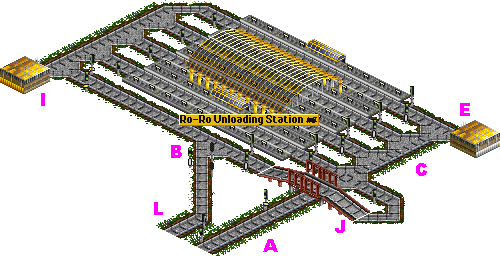 Ro-Ro station is the station with separated in- and out-lines (A and L). It is not the station of the catching type. Catching function is entrusted to in-way. That's why they should be used with one-line ways. Using them with circulars is unpractical, because circular stations should be used instead. Ro-Ro unloading station si represented at the schema 12.1. E depot is used for trains, whose servicing time came before the station, I depot is used for trains, whose servicing time came during unloading. It also used for collecting trains if the out-line is busy. Trains, which have not finished unloading, return to the station via J line-block. As in case of catching stations, this block can be also called «Reverser». Because of occuring traffic jams on «Reverser» in case of high traffic, a special crotch B and depot I are used. The signals system knocks out to line-out L trains, heading to line-block J when it's busy. Known problems - lost trains. When the train is knocked out, the station remains as his order. If a train has a checkpoint in the orders list after the station, it can lost. 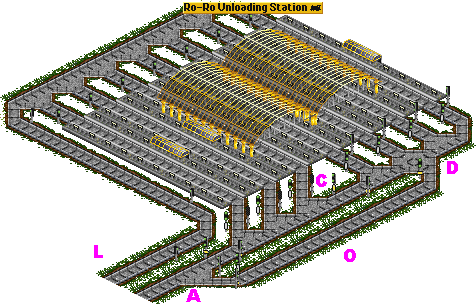 Ro-Ro loading station (schema 12.2) is just like the unloading station. The difference is the distance from the station to the in/out line. In case of unloading station the distance from in-line A to the station is minimum. In case of loading station the distance from the station to out-line L is minimum. Ro-Ro station can be also connected to two ways at the same time (Schema 12.3). Two ways (A L and A' L') are connected to reversing block J. A buffer O is added to send trains to J block in case all platforms are busy. Depots E and I are build for servicing trains before and after the station, but there is no kicking out crotch B, that means that traffic jams could occur. To prevent traffic jams, J block became a catching zone. Depot F has the catching function. It collects trains in case of overflow to prevent accumulating of trains at the station. To increase the effectivity of such catching schema, signal2waittime parameter should be decreased in TTDPatch.cfg. With the TTDPatch 1.9 the new ability of vehicles behaviour control has appeared. It became possible to prevent vehicles uncontrolled wishes to visit a depot. With TTDPatch 1.9 it became possible to set servicing as a point of the vehicles orders list. That guaranties vehicles completed loading or unloading processes. This ability allows to remove loops, made for vehicles ability to complete the process. This prevents appearing of traffic jams. Schemas 12.4 and 12.5 show Ro-Ro unloading and loading stations in case of using TTDPatch 1.9. Train's orders list for this case is represented at schema 12.6. In case of short distance, high trains speeds and large amount of trains at the unloading station, train's orders list can be reduced as represented at schema 12.7. Such a realization of Ro-Ro stations does not have problems with traffic jams or lost trains. The known problem is - when the train goes to depot before the station, and where is only one free platform, it can be taken by the train, goes next. This case, train will stop on one of the red two-way signals and block the way to the station. If you would like to prevent situation, when the train passes servicing before the station, because it achieves its servicing time on the way back (and a servicing point in the orders list was skipped), you can use the schema 12.8 and train's orders list as represented at schema 12.9. This case, pre-signal W will prevent skipping servicing point, because the train has to pass transit station first. 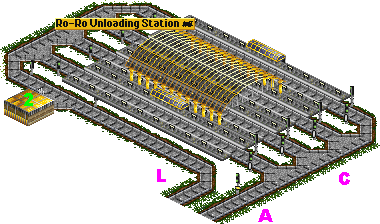 Wide varianth is designed to increase stations capacity. It allows more trains arriving the station at the same time. It separetes the in-line into two blocks (C and D). O buffer before D block allows trains to arrive to D block bypassing C block.